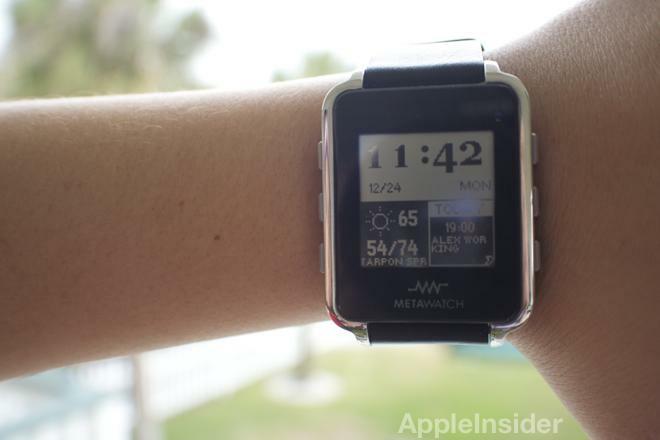 The MetaWatch is the latest example of a so-called "smart watch." AppleInsider cannot verify the publication's assertions and as such offers the following information for purposes of discussion only. According to Chinese publication 163.com (via Mobile Geeks), Apple will release an Intel-powered wrist watch in the first half of 2013, complete with a 1.5-inch OLED display and low-power Bluetooth 4.0 connectivity. The purported "supply chain" source said the screen will feature an ITO (indium tin oxide) capacitive touchscreen manufactured by Ritek, a small Chinese OLED display maker located in Shenzhen with ties to DuPont. Intel's connection with the project is somewhat shady as Apple has moved its entire line of iOS devices completely to proprietary package-on-package chip designs. It should be noted, however, that Intel is said to be working on a mobile processor to compete with ARM-based rivals. While the rumor may be questionable, smart watch devices are seeing a slow rise in popularity as more products come to market. For example, AppleInsider recently took a look at the MetaWatch, a Bluetooth-enabled wrist watch that serves up text messages, calendar alerts and other data directly from a compatible iPhone. Apple's own sixth-generation iPod nano spawned an entire cottage industry of third-party accessories that allowed users to wear the device like a watch. While the company built in Bluetooth capabilities with the current iPod nano, it changed the form factor to more closely resemble a tiny iPhone than something wearable.